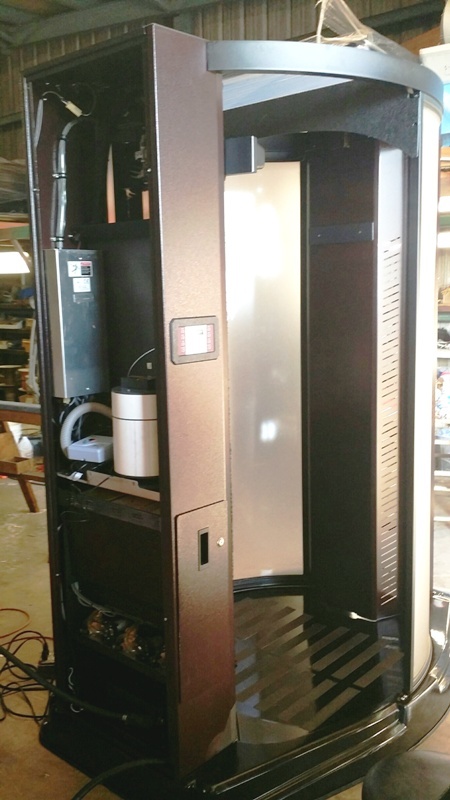 We have completely refurbished a Magic Tan VersaSpa automatic UV free spray tan booth and now offer it for sale with free installation in most parts of the USA and Canada for only $12,999. 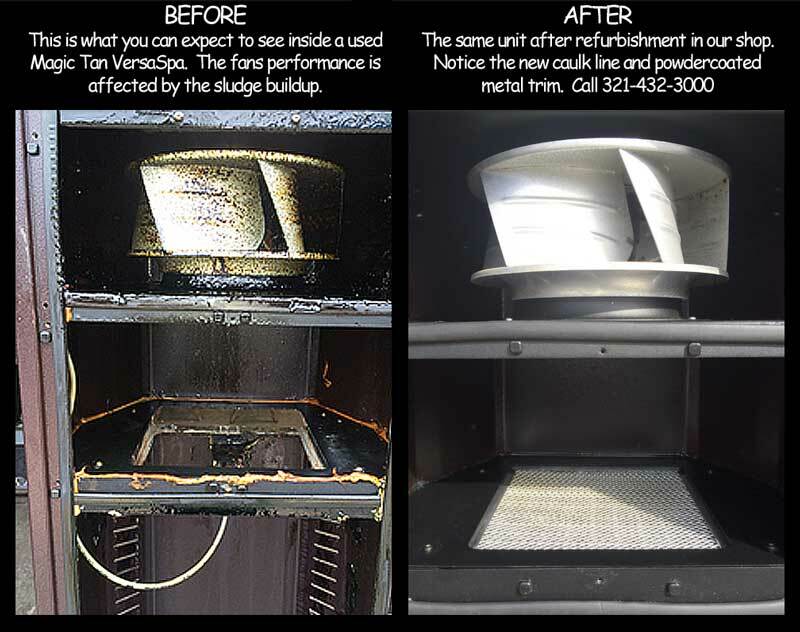 As you may know, they are $24-29k+ new and Sunless, Inc has recently rolled out the new VersaSpa Pro model which has flooded the market with these 2-6 year old gently worn units which are perfect for restoring. 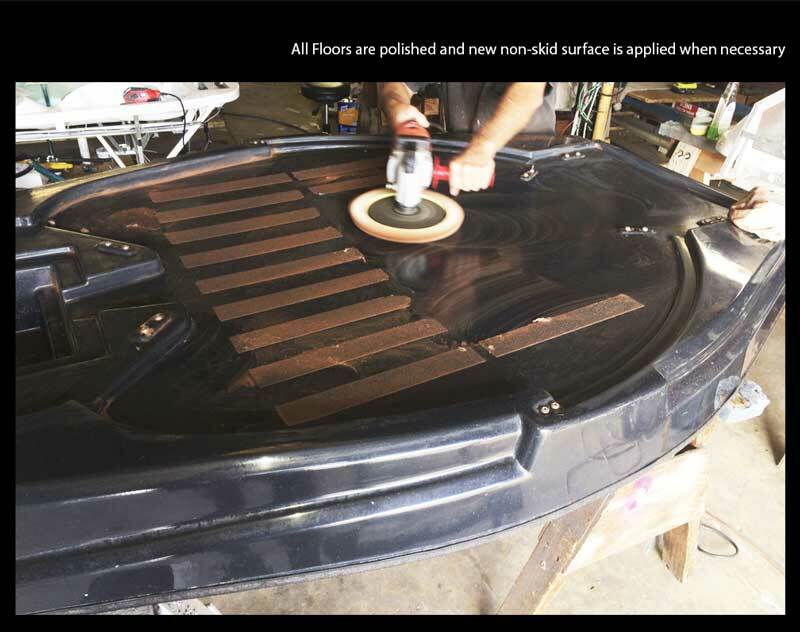 As the pictures shown here illustrate, we strip down the Versa to the shell and restore or replace nearly everything, including the shell. 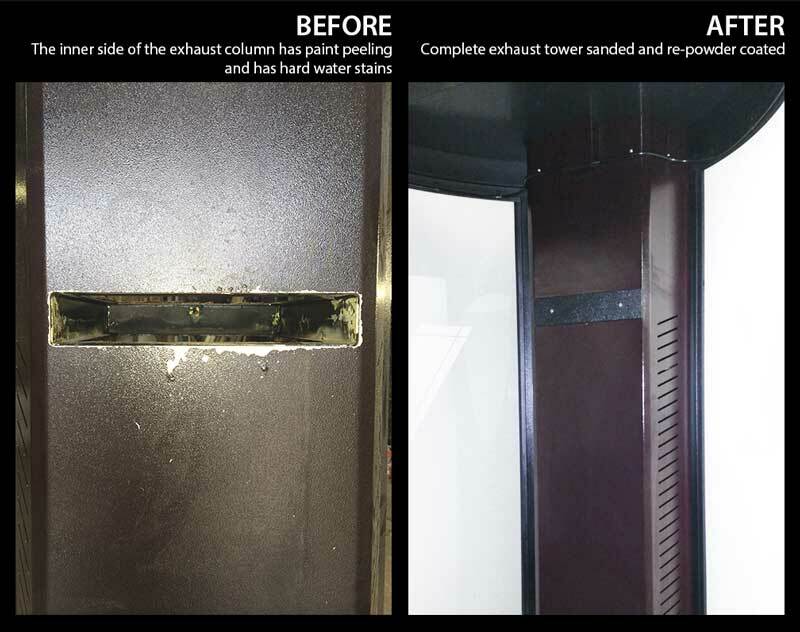 We repaint all metal parts, replace pumps and motors, add heaters and dryers, and update the software with the latest upgrade to run everything smoothly. You can expect the session count to read "0" when you receive this completely restored Magic Tan VersaSpa. Our price of $12,999 includes installation and 30 day warranty to most of the USA. Please scroll down to view before and after photos of the work we perform during the restoration process. 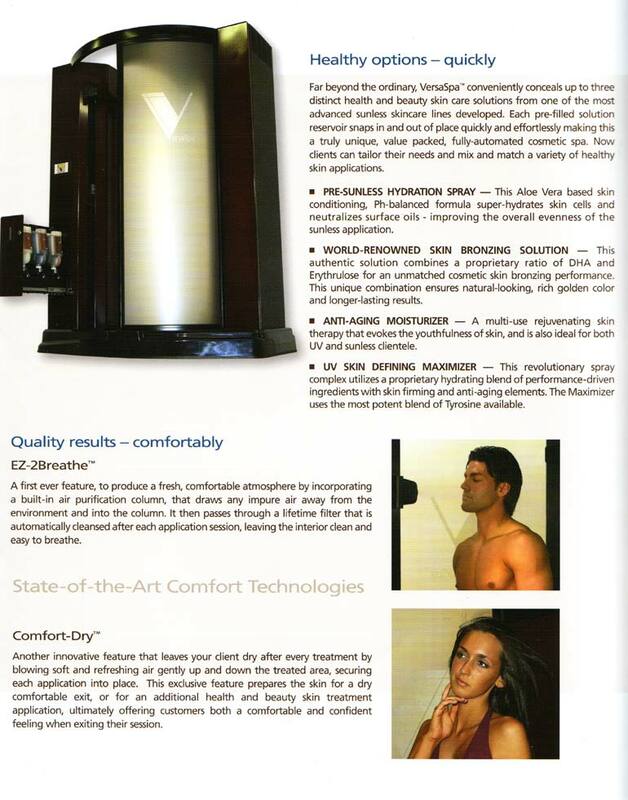 If you are not familiar with this new and improved automatic UV free spray tan delivery device, it is a multi-treatment system which also applies lotions and moisturizers as well as UV free spray tanning lotion containing DHA. DHA is the active ingredient which interacts with your top skin layer to turn it brown. This price DOES include features such as voice prompt, heater, dryers, delivery and free installation Florida, Georgia, Texas, Oklahoma, Illinois, New York, New Jersey, Tennessee and Ohio. We will ensure the latest software has been installed and updated, offer a 30 day parts warranty and free starter kit with all models we sell on this website. Please scroll below to see video of this booth in action. call 800-667-9189 to order today or email us here with questions. We now are actively buying any used VersaSpas. Please call 800-667-9189 or Email Us today if you have a unit for sale. 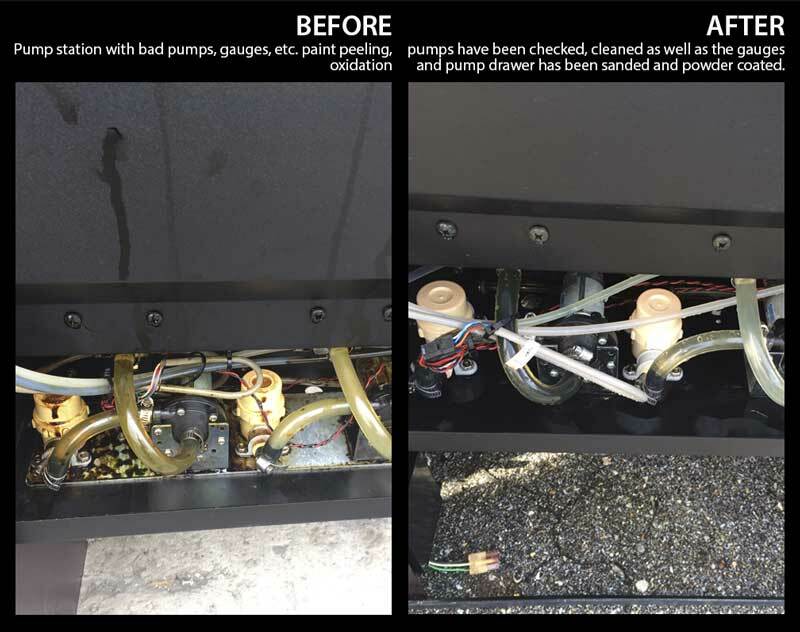 This gently worn Versa Spa has been returned to our service shop in Florida and reconditioned before installation, view restoration photos here. 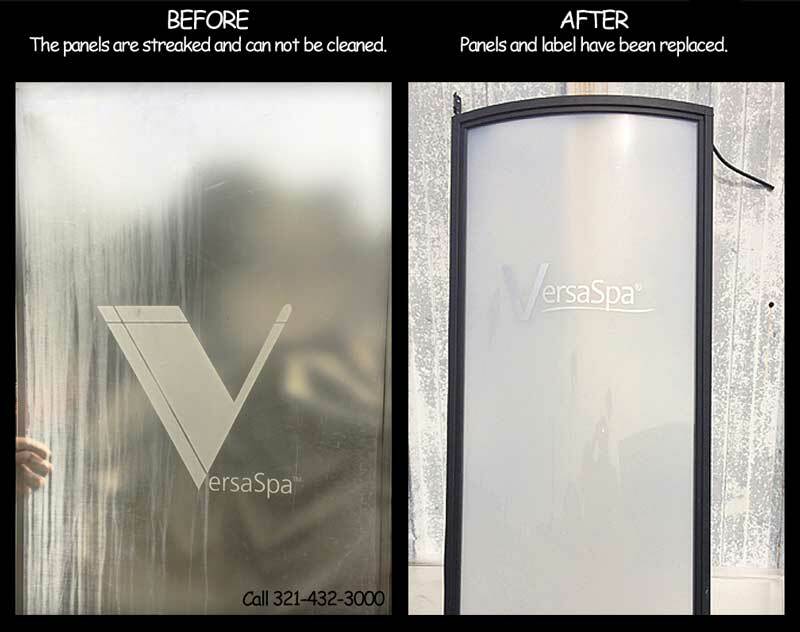 We will offer a 30 day warranty with a full price purchase of this used Versa Spa for sale and will deliver it for free in the following states: California, Nevada, Washington, Montana, Nebraska, Texas, Arizona and New Mexico. Click to enlarge and view or download and print any of these very helpful documents about the Magic Tan VersaSpa including the Operating Guide and Manual pictured bottom right. They include the Sunless, Inc catalog, proud owner of all the patent and copyrights to all the brands and names on this website and should be acknowledged as such.